Now that Marley is pretty much an adult – he’s three in June – we are getting in to some pretty excellent stories at bedtime (well, if he’s a good boy and he brushes his teeth). Beginner books like Baby’s First Words and This Rabbit, That Rabbit (good though it was) only tended to contain about four words per page. And with his penchant for long conversations these days, they just don’t cut it anymore. So now, with authors like Julia Donaldson and their seemingly-endless array of rhyming stories about various creatures like The Gruffalo and The Highway Rat (brilliant!) things are getting a bit more tasty. 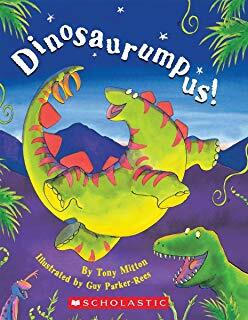 Tonight’s installment came in the form of Bumpus Jumpus Dinosaurumpus (what a name!) courtesy of Tony Mitton and illustrated by Guy Parker-Rees. As I’m sure you can imagine, it all revolves around some kind of Jurassic night out. There’s a whole load of different dinosaurs all tanked up and heading to some kind of rave, when along comes a furious T-Rex…..who I reckon is basically that guy who ALWAYS has one too many and takes things that bit too far. Everyone is having a good old time, but when they hear T-Rex roaring away they are convinced it’s all about to kick off…. They realise that all he really wants is a good old-fashioned dino-romp!! Everyone has a fantastic time, they party the night away…….and then all have a huge come-down and fall asleep in a giant dino-heap. It’s actually a great story, the perfect length for a two-and-a-half year old, and you can get really into it as the reader (plus on every page there’s a repeated little rhyme so the little ones can easily join in). The only down-side to this particular dino romp are the words “Deinonychuses” and “Styracosaurus” that need to be said quickly during the rhymes – which is nigh on impossible. 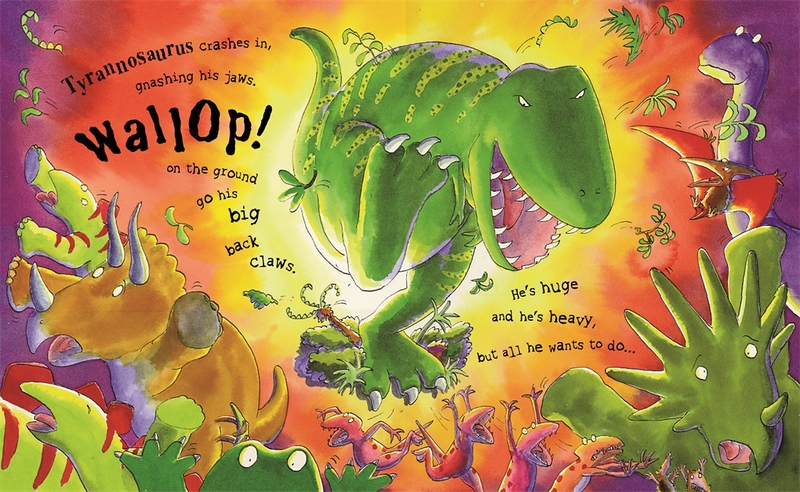 But I’ll let that slide, since it also contains the words “wallop” and, of course, “dinsoaurumpus”. 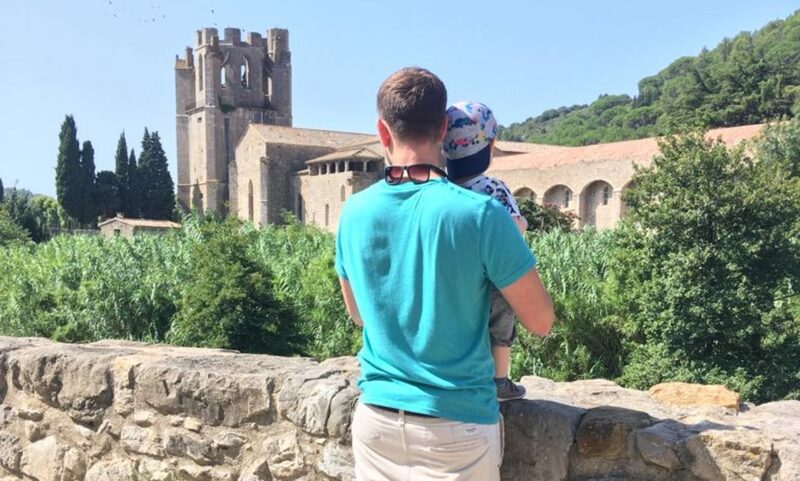 Marley enjoyed it a lot, and I absolutely loved it…..which is, obviously, the main thing.